Brasilia, a capital created ex nihilo in the centre of the country in 1956, was a landmark in the history of town planning. Urban planner Lucio Costa and architect Oscar Niemeyer intended that every element - from the layout of the residential and administrative districts (often compared to the shape of a bird in flight) to the symmetry of the buildings themselves - should be in harmony with the city's overall design. The official buildings, in particular, are innovative and imaginative. 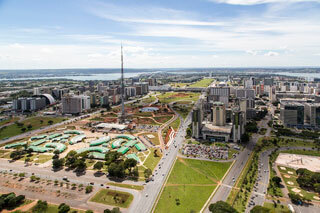 This article uses material from UNESCO World Heritage List article "Brasilia", which is released under the Creative Commons Attribution-Share-Alike 3.0 IGO License.